A group of 22 clergy members, known as the Medicaid 23, has been found guilty of trespassing, but not guilty of obstructing a government function. After a three day trial in a Cole County Court and deliberating for four hours, the jury handed down its decision. 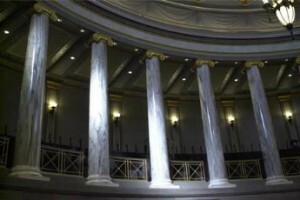 The Medicaid 23 staged a 2014 protest in the Missouri Senate chamber during debate, singing hymns and chanting “Expand Medicaid”. The protest temporarily shut down debate in the Senate that day. The group refused to leave the chamber, leading Capitol police to arrest them. Jefferson City state Representative Jay Barnes and Rod Chapel, president of the Missouri NAACP, served as defense for the Medicaid advocates. Critics argue that the trial was racially motivated. Most of the protesters are African-American. Sentencing is scheduled for Thursday morning. The protesters face fines or up to six months in jail.